I was there to discuss some secret plans with Julia, to see the gorgeous designer wedding dresses she stocks and to discover the story behind Julia Tasker Bridal Couture. It was such a lovely experience – it’s great to know some of my favourite designers are right here in the Lake District: Sassi Holford, Ritva Westenius and Caroline Castigliano take centre stage alongside Paloma Blanca and Pepe Botella. 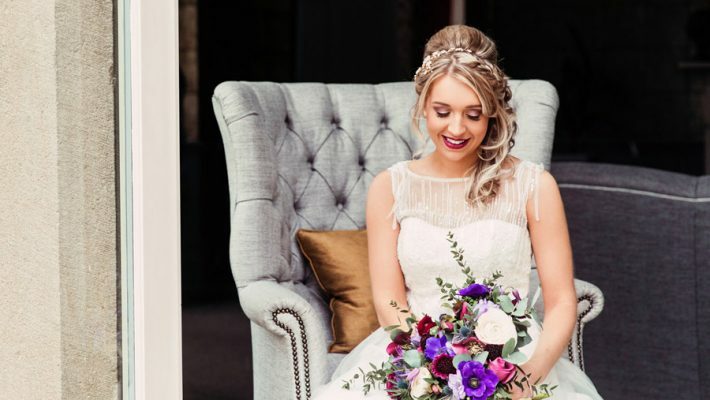 Exquisite lace, contemporary designer wedding dresses and a vintage twist – with lovely customer service too! Inside the boutique is cosy, welcoming and promises an unforgettable experience for brides! I would absolutely recommend Julia Tasker Bridal Couture to any bride getting married in the Lake District. She stocks the best designers; she provides the most luxurious yet relaxing experience in the loveliest of settings – and she also provides a couture service of her own. Julia trained in fashion design and has has twelve years experience providing a full couture service. Imagine having a totally unique gown created, a truly one-off creation designed and hand made by Julia in her studio located within her new shop. Julia brings her expertise and enthusiasm born out of a genuine love for her work to provide a unique personal service. Visit juliataskerbridalcouture.co.uk and see Julia’s Facebook page for latest news and images from the shop. Oh! And watch this space to find out what I’m secretly plotting along with Julia and a few other creative and wonderful wedding friends of ours!